Proper termination of all high frequency transmissions lines is critical; unless you want to get some signals reflected, which is not the topic of this little post. 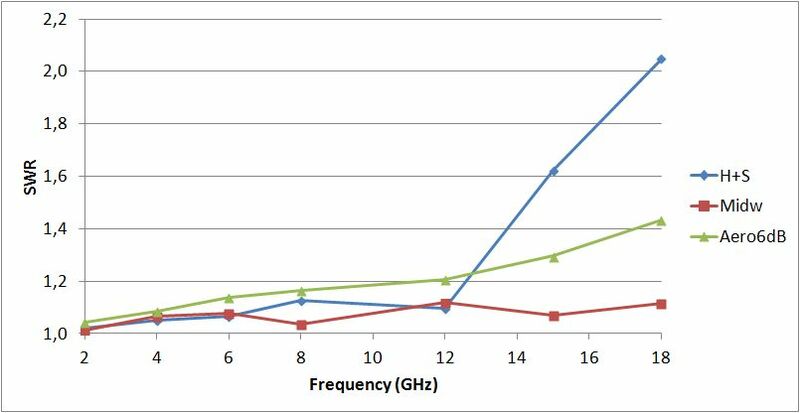 For most of the items we deal with, systems are operated at 50 Ohm characteristic impedance, at least when it comes to instrument-to-instrument and sub-system/module connnections, and GHz frequencies. 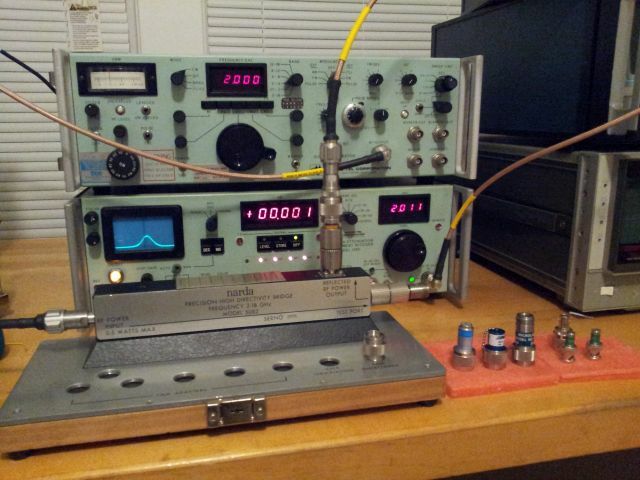 The test setup: Micro-Tel SG-811 Signal Source, Micro-Tel 1295 Precision Attenuation Measurement Receiver, Narda Precision High Directivity Bridge Model 5082, Narda APC-7 to N adapters. 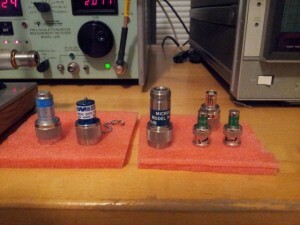 The test procedure: At each frequency, full reflection (open) is used to set the “0 dB” level. Return loss can then be measured directly as attenuation of the reflected signal, when the termination is attached to the test port. To determine the error limits of the SWR measurement, the directivity is known, the insertion loss of the bridge has been measured, and the attenuation measurement error itself (by the Micro-Tel 1295) is negligible. There are clearly two groups, the terminations made for GHz service, and the others – BNC, items (4) and (5), that were not. 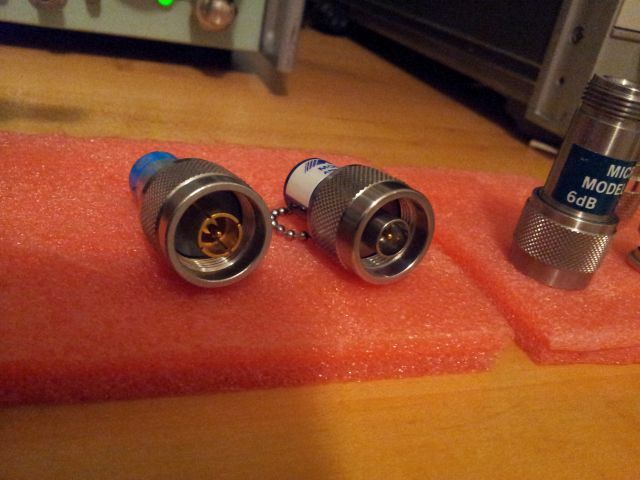 Interestingly enough, at 6 GHz, these terminations are more or less ideal, with SWR close to 1. So you can use these at exactly 6 GHz, and integer-multiples of 6 GHz, but still, I would suggest not to. They are also working great at DC, because of their “+-1%” accuracy which is mentioned on the label. A closer look at the real performers – the Huber+Suhner, although only specified to 6 GHz is working well within its SWR max. 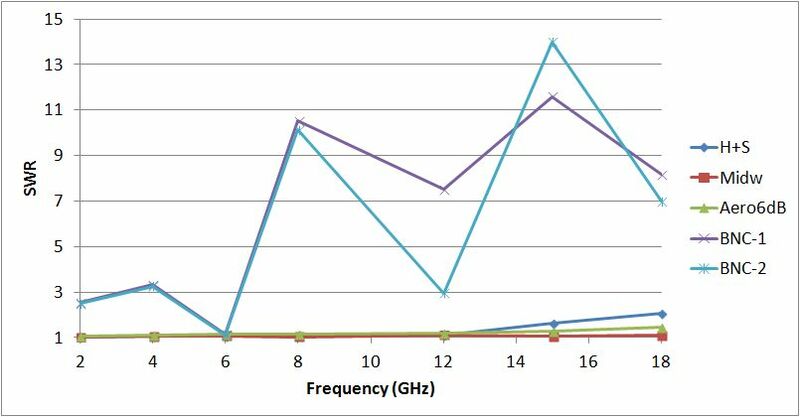 1.2@6 GHz specification, even considering the error limits of this measurement, and can be used up to 12 GHz, no problem. The Midwest Microwave 2070 – I like this model very much, because of the rugged stainless steel construction (nothing gold-plated and fancy; you can get these for a few dollars, from surplus). It is way better than specified (SWR max. 1.25, measured: 1.12) – and, at 18 GHz, within the limits of the HPAK 909F Precision Coaxial Termination, intended as calibration standard, and listed for close to 1 k$. Attenuation is defined as insertion loss minus reflection loss. 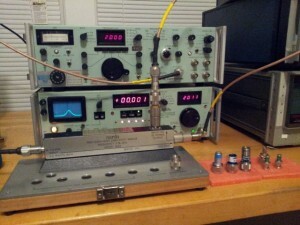 The insertion loss measurements – that’s quite straightforward, with signal genarator and receiver. We will deal with the particulars later. For the reflection loss, we still need another device, a directional device. Either a directional coupler, or a return loss bridge. (1) It is a fairly robust device, and offers N and APC-7 connectors. Luckily, APC-7 adaptors were included. Also included was a combined short/open, APC-7 style. That’s really great. (2) It is very broadband, 2-18 Ghz full range with one device. This eliminates connections – there are hardly and couplers available that offer 35+ dB directivity, over the full band. (3) The bridge has a bit more insertion loss compared to a coupler/multi-coupler solution, about 6 dB, but the loss is well defined and flat, will be calibrated out. (4) It was available, at a few cents for the list price in dollars, and in pristine condition. Next step: need to connect the “reflected” port to a switch matrix, via an APC-7 to SMA adapter (which I don’t have in my collection).